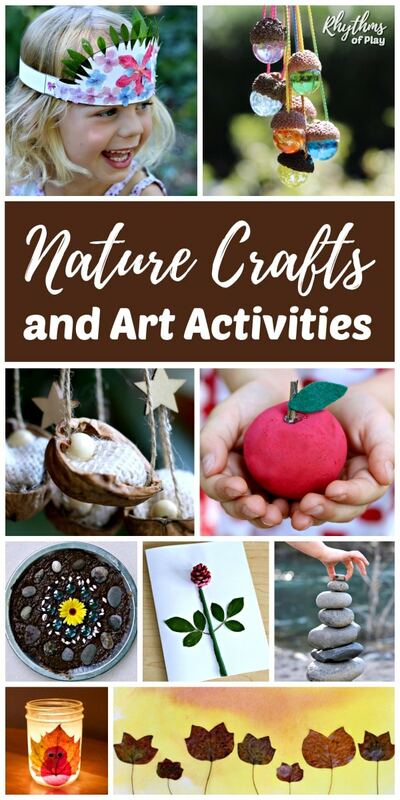 Nature crafts and nature art projects for kids and adults of all ages. 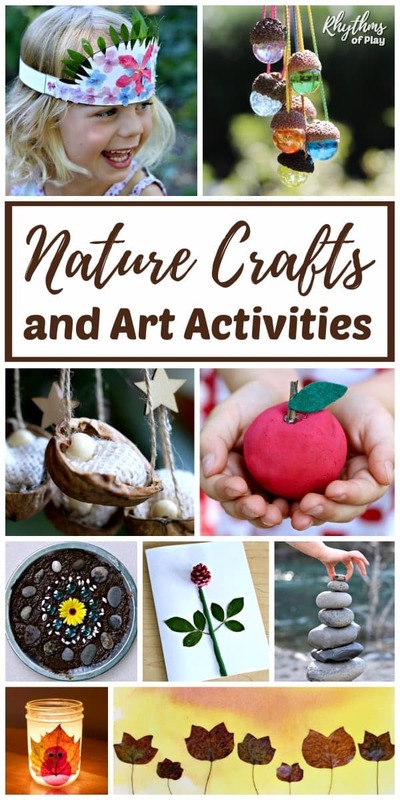 This awesome collection of nature craft and nature art activities includes fun and easy ideas for crafting and creating art with acorns, flowers, leaves, mud, pinecones, rocks, shells, sticks, twigs, walnuts, and more! Encourage children to go on a nature hunt to collect natural materials. Next, use the materials that you find in nature to engineer crafts and use for process art activities. When your kids run out of ideas, feel free to suggest any of the nature crafts and nature art project ideas below. Remember that these are only suggestions. Allow your children to use the ideas in their own way to create natural arts and crafts using items that they find in nature. In other words, use this collection of nature activities as a springboard to inspire your child’s creativity. This collection of nature crafts and nature art ideas using natural materials is arranged in alphabetical order so you can easily find crafts for the type of natural materials that you will be working with. Click the blue hyperlink text for all the DIY details for each nature craft or nature art project for kids and adults of all ages. This list of nature craft ideas that use natural materials will be added to as we continue to create more nature crafts and nature art projects, so be sure to bookmark this page for easy reference! Use acorn and acorn caps to create nature art and crafts. DIY Acorn Peg Dolls – Handmade dolls that kids can make with acorn caps and peg dolls and use for dramatic play. Rustic Acorn Marble Ornaments – Collect some acorns and find some marbles to make these rustic DIY ornaments for your Christmas tree. Acorn Frame | An Extraordinary Day – Make a simple photo frame with acorns and acorn caps. DIY Acorn Wreath | Tried and True – Use acorns to make a rustic wreath to hang on the door. Acorn Marble Necklaces – Make gorgeous necklaces using natural acorn caps and glass marbles. 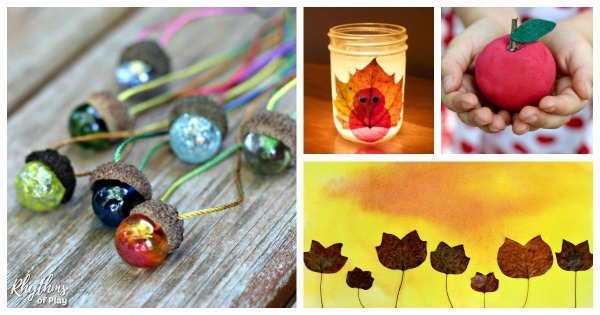 A nature craft and homemade gift idea for kids! Each of these nature craft ideas uses real flowers as a crafting material. Top 10 Flower Suncatcher Crafts for Kids – Use real flowers to add a pop of color to your windows with this easy nature craft idea for kids. 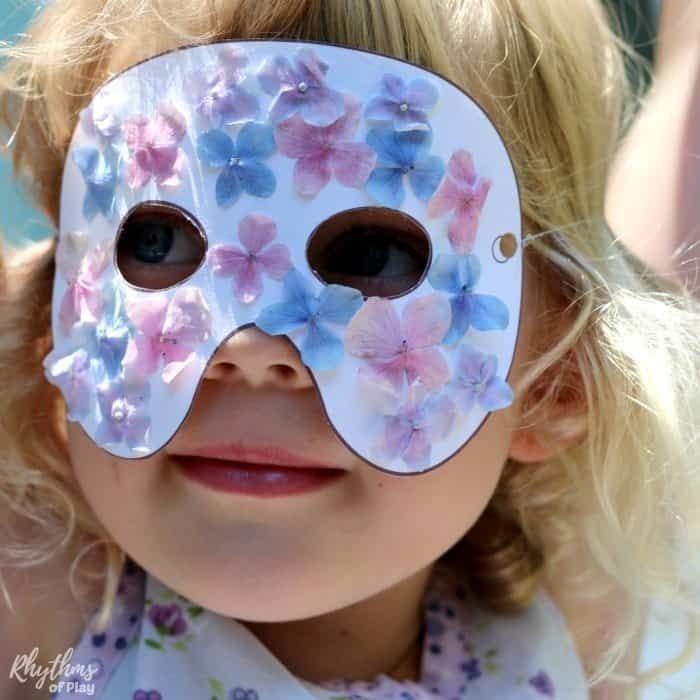 Nature Craft Printables: Masks, Crowns, Tiaras and More! – Make nature crafts using natural materials including real flowers and leaves to make your own masks, crowns, tiaras, and more! Real Flower Nature Crafts for Kids and Teens – Gorgeous nature activities that use real flowers to create nature art. Nature Craft Printables for Kids – A fun collection of nature craft printables and ideas to use with flowers and other materials found in nature. There are so many fun ways to make nature arts and crafts using real leaves. Check out all of the fun ideas below. How to Press and Preserve Fall Leaves – Preserve the vibrant colors of autumn leaves and save them to use for leaf crafts and leaf art projects. Watercolor and Fall Leaf Art – Use real fall leaves and watercolor paintings to create gorgeous nature art. Leaf Baby – Make a leaf baby with real fall leaves. A book-inspired nature craft and activity for kids of all ages. Fall Leaf Lacing Beginning Sewing Activity – Sturdy fall leaves are easy to turn into lacing cards in this beginning sewing project and craft for kids. Using real leaves makes this beginning sewing lesson both economical and eco-friendly. Thanksgiving Leaf Turkey Crafts -Make turkeys for Thanksgiving using real fall leaves with this collection of easy nature crafts for kids. Thankful Tree with Real Leaves – Make a thankful tree for Thanksgiving using real fall leaves and bare branches. It’s a lot easier than you think! Heart Leaf Lanterns – This nature craft makes a gorgeous centerpiece and a great gift idea. Invitation to Create Fall Leaf Art – Create fall leaf art with this nature art invitation using real fall leaves. 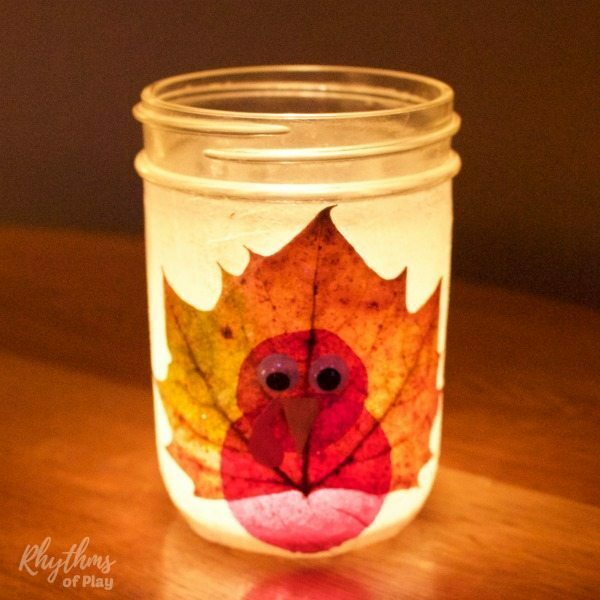 Turkey Leaf Lanterns Nature Craft – Use an autumn leaf to make this simple nature craft for kids and adults. Mud is a classic art and craft material of childhood. Its a sensory play material, craft material, and can be used to make nature art in lots of fun ways. 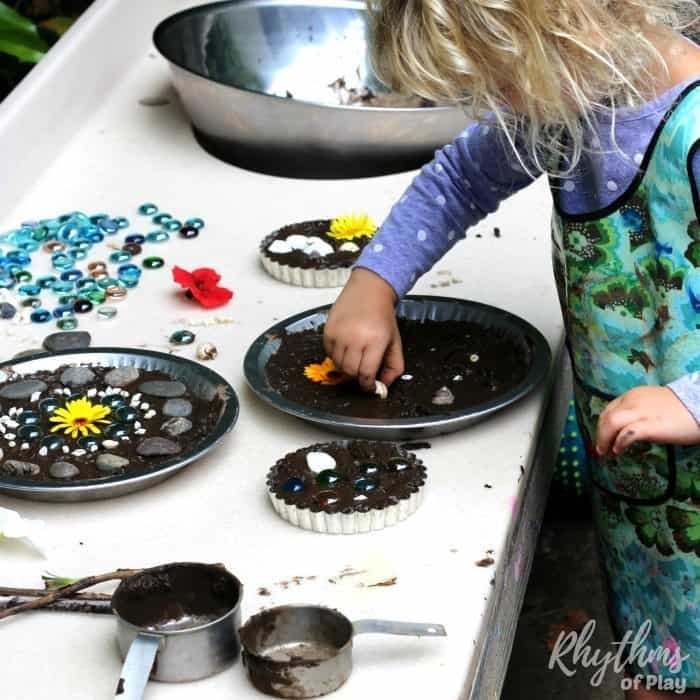 Mud Pie Nature Art – Try a new twist on the classic mud pie with this fun outdoor art activity for kids. Paint with Mud – Use sticks or paintbrushes to paint with mud on paper, the driveway, or the sidewalk, then all you need to do is wash it off with the hose when you are done! Have you ever crafted with those funny little apple shaped growths found on and around oak trees? 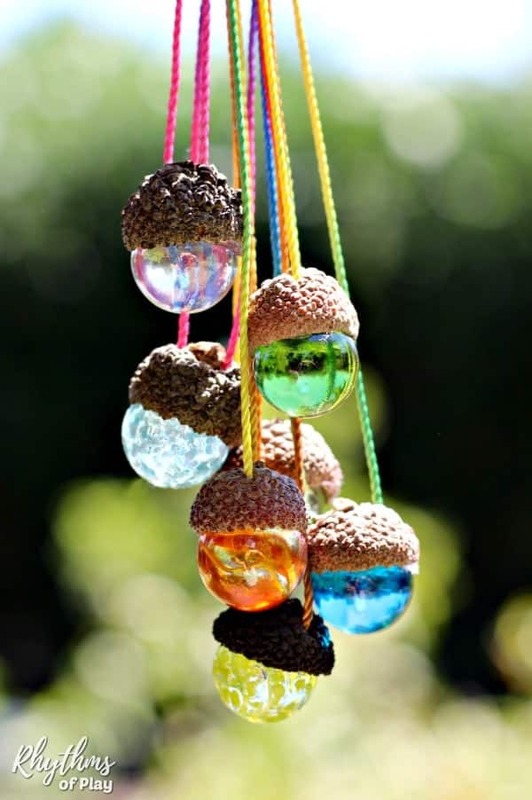 Try either of the oak ball nature art and craft activity ideas below. 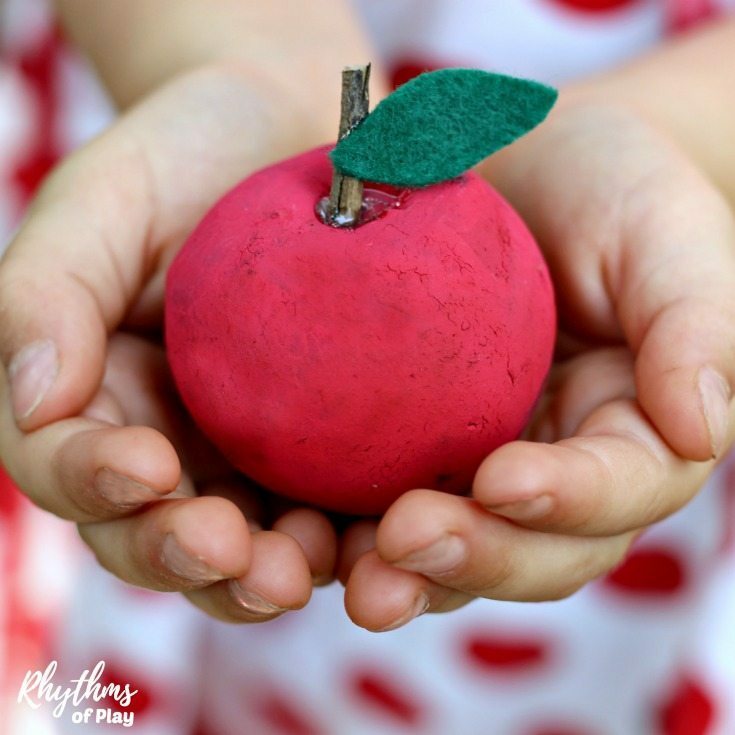 Oak Apple Nature Craft – Paint oak balls to look like apples with this fun nature craft for kids. Paint Oak Balls – Oak apples are a fun free canvas that children love to paint. Use biodegradable paints for even more fun. There are so many fun ways to use pinecones for arts and crafts! Rhinestone Pinecones – Add a little bling to the pinecones you find with this simple fine motor nature activity and craft for kids. Easy Pinecone Ornaments – Turn your rhinestone pinecones into ornaments for your Christmas Tree. Pinecone crafts and activities for kids – A fun collection of pinecone crafts and activities for kids. 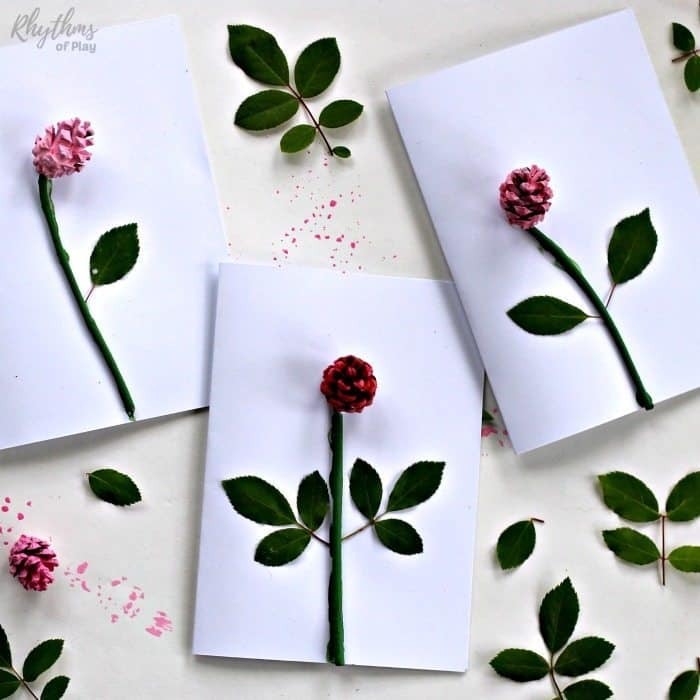 Pinecone Rose Card – Use a small pinecone and a twig to make a rosebud card for mom. Try some of these rock crafts and painted rock ideas for kids. How to Paint Rocks and Easy Rock Painting Ideas for Kids – Learn how to paint rocks and check out the best rock painting ideas for kids of all ages. Painted Rock Fairy Houses Craft – Turn any garden into a fairy garden with these super cute painted rock fairy houses. Stone Owl Nature Craft – Make stones into owls with this simple nature craft for kids. 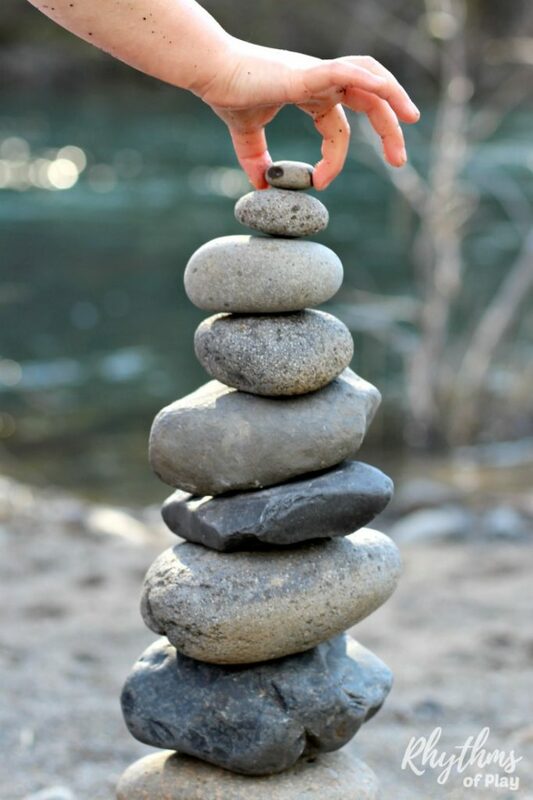 Rock Balancing Stone Stacking Art – Stack rocks on top of each other to create art with this fun nature art activity for kids and adults! Use the shells that you collect on your daily adventures and family travels to make these fun nature arts and crafts. DIY Shell Frames with Handprint Keepsake – Decorate wood frames with shells and add photos, artwork, handprints or footprints to this homemade gift from the kids. Shell Sunflower – Make a sunflower craft using shells. Stone and Shell Owls – Small bicuspid shells make great owl eyes. Calming Sea Shell Sensory Bottle – Add seashells to any bottle from the recycle bin to make this calming sensory bottle for kids. 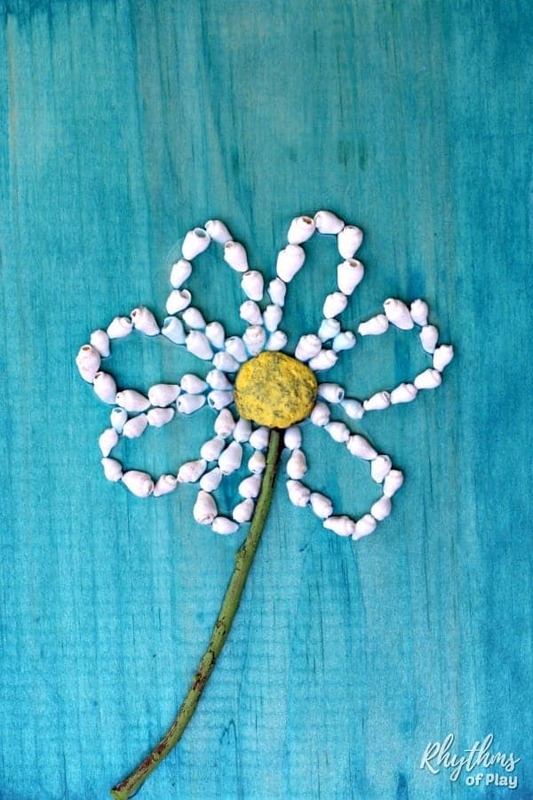 Easy Shell Daisy Nature Craft – Use shells to make a daisy. Make Sunprints – Make beautiful pictures by placing objects on sunprint paper and exposing it to the sun. 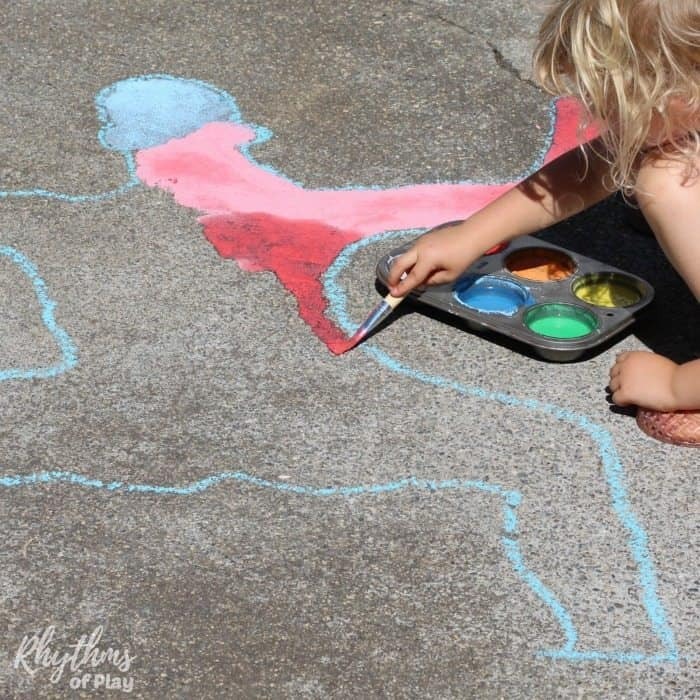 Shadow Outdoor Art Project for kids – Make art with shadows and DIY chalk paint. There are so many fun ways to use twigs, sticks and bare branches. Check out some of the fun nature activities below. Easy Felt Flowers on Twig Stems – Enjoy flowers in the home all year long that are made of wool felt and twig stems. Spring Easter Tree – Decorate an Easter Tree this year! DIY Butterfly Tree – Make a butterfly tree centerpiece for your home. Giant Stick Spider Web – Create this fun Halloween decoration made with giant sticks. Thankful Tree with Real Fall Leaves – Use bare branches and real fall leaves to create a thankful tree. Nature Paintbrushes | Messy Little Monster – Make paintbrushes out of natural materials to create art with this fun nature activity for kids. Rainbow Wind Chimes | Happy Hooligans – Homemade rainbow-colored wind chimes are a super easy nature craft for kids. Yarn Sticks | Babble Dabble Do – Start with a stick hunt outside, then grab a bunch of yarn to wrap them to make this easy nature craft. Nature Weaving | The Chaos and the Clutter – Use sticks, and other natural materials to weave beautiful nature art. 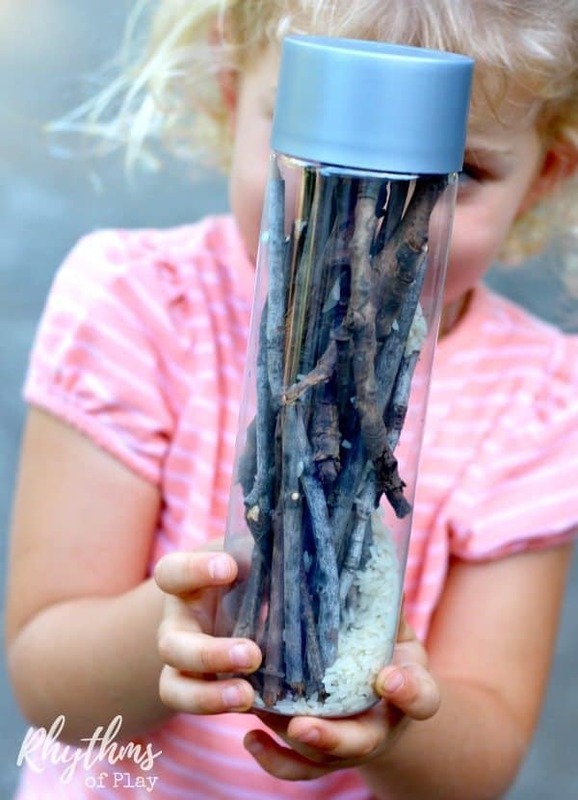 DIY Rainstick Musical Sensory Bottle – Kids love this see-through rainstick made with sticks. Try some of these walnut shell art and craft ideas for kids. Walnut Shell Manger Ornament – These walnut shell ornaments are super cute and easy to make. Easy DIY Nativity Scene – Use craft sticks, peg dolls, and a half walnut shell to make this simple handmade nativity set. 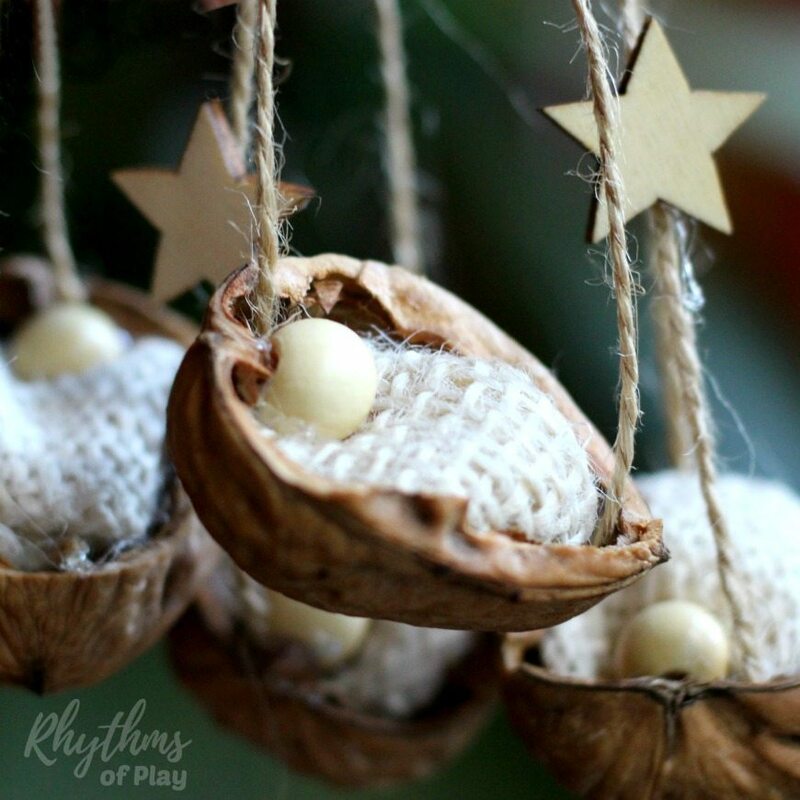 Walnut Mice | Red Ted Art – A nature craft to use with the classic nursery rhyme, Hickory Dickory Dock ! Walnut turtles | No Time for Flash Cards – Walnuts make great turtle shells in this nature craft for kids. Use any of the nature craft and nature art ideas to create arts and crafts with natural materials. Or, use this collection as inspiration to create your own masterpieces. For more amazing ideas be sure to check out the nature crafts over on Red Ted Art, and the nature art activities over on The Artful Parent. Don’t forget to check out our collection of fall nature crafts for kids and teens, and our massive collection of outdoor learning ideas and nature activities for kids.